So… Stood up some 2012R2 XA7.6 servers the other day, using PVS7.6 and cache in RAM with overflow to disk. Then I saw that I had files in the WriteCache directory on the PVS server. WTF? After some screwing around, I found the solution. Apparently PVS can’t use a disk that is GPT, you must use MBR. Once I switched that and reformatted the disks, viola! Everything worked exactly as it should. You know, there are only so many delays I’m willing to deal with in a day. First, there’s the bug earlier that bit me during install. Can’t have a space in the name of the OU. Now, I find another one that gave me the redass. HARD. So you’ve got vSphere 5.5. Excellent. Citrix says it’s supported. Everything looks fine. The customer wants v10 VMs, which is a pain (mostly because VMware’s web interface is a kludgy, bug-ridden POS), but whatever. NOTE: Yes, I’m a VCP, too, so don’t think I’m just “hatin on the competition”. It does need work! So you build your base image, optimize it, and install the PVS Target device driver. Reboot, and it hangs loading windows. I actually removed the bootux disabled entry using bcdedit just so I could see what was going on. With v10 VMs, VMware attaches the virtual CDROM using SATA, not IDE. Apparently the PVS target device driver can’t deal with that, so the VM never finishes loading. NOTE: It ONLY does this when there’s a vDisk attached – if you remove the vDisk from the target device, Windows will boot every time, so it’s not like the driver just outright breaks something. Even more infuriating. The solution? Switch the CDROM to IDE. Then, don’t forget to remove the SATA adapter from the VM. Then after you’ve done that, make sure you go into device mangler and remove all the dead stuff – the SATA adapter itself, as well as any ATA channels that are no longer present. 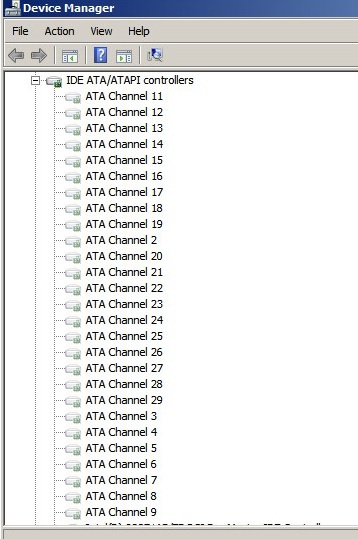 You should still see two ATA channels present after the removal. Basically, you want to remove all the grayed out items. How? Open an administrative command prompt, and enter “set devmgr_show_nonpresent_devices=1”. Then click view, and then show hidden devices. Then expand IDE/ATA adapters, and remove all that stuff. Again, remove only the grayed out items. While you’re in there, check the Network Adapters, and remove all the grayed out NICs, too (but you already did that, right)? *IF* you found any grayed out NICs and removed them, you should uninstall and reinstall the target device driver to ensure it binds to the correct NIC. Then go ahead and re-run the imaging wizard, and you should FINALLY be able to pull an image of your VM. Me? I’m pretty disappointed in Citrix. vSphere 5.5 has been out for a while now, and PVS 7.6 was only just released a couple months ago. One would think they could have accounted for this, or at least made prominent note of it somewhere telling people about the problem. But alas, here I am having to blog and complain about it. Maybe next time.. So, I’m doing my first production build of PVS 7.6 servers for a customer. This particular customer had an OU already defined for all of their security groups. Ok, no problem, I’ll put the security groups in there for farm administrators and such. The OU had a space in it. The installation took just fine, but then it would not let me into the farm. I got the old “This domain/user does not have access to the farm”. Gee, thanks. So, I go check the dbo.AuthGroup table. It had a single entry, and it was correct: “Domain.com/security groups/group”. I moved the group to an OU without a space in the name, deleted the database, and re-ran the config wizard to create a new farm, and whuddya know? It all started working again. Even though Citrix wasted an hour of my time with this, hopefully you won’t waste yours. Apparently PVS has some issues with DST. Time doesn’t get updated correctly on targets, duh. How does this manifest? Event logs out of order, GPOs not getting applied, etc etc. How do we address this? Well, in PVS-land, one of the most important GPOs you have is the one that says “Do not change machine account password”. If that one doesn’t work, no one can log into any of the targets because domain trust is messed up, right? Well… Imagine if for some reason your GPOs failed to apply! What then?? Change the image mode to private image and check that the Local Security Policy Domain member: Disable machine account password changes is enabled within the vDisk image. — this is important so that the machine account password policy remains in effect even if GPOs aren’t correctly applied. Resynchronize the computer before you restart. Click Start > Run. Enter cmd to open the command window. Then restart, log in, and I recommend a gpupdate /force. Then, shut down, flip back to standard, deal with KMS as necessary (see previous post), and you should be good. So, you’re building a XenDesktop environment and you want to mirror the database for it. while you’re at it, why not mirror PVS and XenApp, too? They both support it. But how do you do it? You’re a Citrix admin, not a database admin! Start by installing SQL Standard (or Enterprise) on two different servers. Do NOT put the databases on the system drive! Otherwise, just a vanilla install is fine (make sure to install SQL management studio). Then right click in the query window and select execute. Copy the file XenDesktop.bak to the second SQL server. Right click Databases and select Restore Database. Enter XenDesktop as the database name, then select From Device, and browse to the file. Then, check the box in the display next to the file name. Then click Options in the left pane, and then make sure to select “without recovery”. Now, go back to the first SQL Server and right click the database and then in the left pane, click Mirroring. Click Configure Security. Make sure the box for Witness Server is unchecked (if you want a witness, you can read more about it on MSDN, but this is a Citrix blog, not a SQL blog, so we’re keeping it simple). Then enter the information for both the SQL servers. Then for the account, use your SQL service account for each server (your SQL Servers do use a service account, right? If not, go change it now – because if you want to use local system or network service, you need to use certificates, and I HATE certificates!). Since the SQL servers in my deployments are generally dedicated to Citrix databases, I like to use the same service account for both servers. If you use a different one for each server, just make sure you enter the correct one for each server. After the wizard completes, click start mirroring. That’s it. Obviously, put the name of your SQL Server in there. Then just start the IMA service back up. Nothing special should need to be done with PVS, provided the databases are correct.